The full-depth OHC has increased by 0.74 [0.68, 0.80] x 1022 J yr-1 (0.46Wm-2) and 1.22 [1.16–1.29] x 1022 J yr-1 (0.75Wm-2) for 1970–2005 and 1992–2005, respectively…. the ensemble median has excellent agreement with our observational estimate: 0.68 [0.54–0.82] x 1022 J yr-1 (0.42Wm-2) from 1970 to 2005 and 1.25 [1.10–1.41] x 1022 J yr-1 (0.77Wm-2) from 1992 to 2005. OHC be a fundamental metric for climate model validation and evaluation, especially for forced changes (decadal timescales). which seems related to something Roger Pielke Sr and I wrote about a while ago. I think this paper is very interesting, especially as Anthropogenic Global Warming (AGW) is fundamentally about energy; our emission of greenhouse gases (GHGs) drives the system further and further out of energy balance, with most (~93%) of the excess energy going into the oceans. 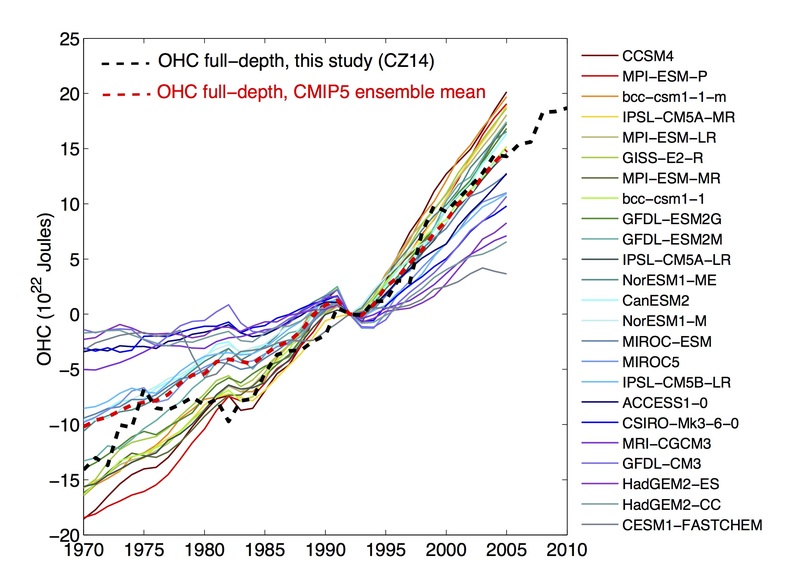 Therefore, as the paper suggests, using Ocean Heat Content (OHC) to assess climate models makes a great deal of sense. Also, since the energy imbalance is largely driven by the change in forcing and the resulting feedbacks, if the models are doing a reasonable job of representing the change in total energy, then it provides some confidence that estimates for equilibrium climate sensitivity (ECS) are reasonable. The transient climate response (TCR) is maybe less clear, but if the models do a reasonable job of representing the distribution of energy within the system, then it should also provide confidence in TCR estimates. As the table below shows, the models quite closely match the full-depth OHC change, as well as the 0-700m OHC changes. To be clear, though, some models suggest a larger OHC change than has been observed, and some suggest less. As the paper itself says, [t]he CMIP5 models show a large spread in OHC changes, suggesting that some models are not state-of-the-art and require further improvements. However, that the ensemble median is in quite good agreement with the observations provides some confidence that some models are doing pretty well, and that you can at least use the ensemble to assess AGW. Also, this whole process of comparing observations and models is a crucial part of doing research. If we had multiple Earths and a time machine, it could be pretty easy to develop the ideal model. Since we don’t, it’s not easy and takes time, as we both collect more data and develop new methods for analysing the data. This entry was posted in Climate change, Climate sensitivity, Global warming, Research, Science and tagged Climate models, CMIP5, ECS, John Abraham, Kevin Trenberth, Lijing Cheng, Ocean heat content, OHC, TCR. Bookmark the permalink. Welcome back, Anders. I have been wanting a model/obs comparison for OHC for some time now since that’s where most of the heat is being retained. This is golden. Since 93% of the solar heat gain is going and will continue to go into the hydrosphere, rather more thought should be given to the evolution of water albedo with human action and climate change. 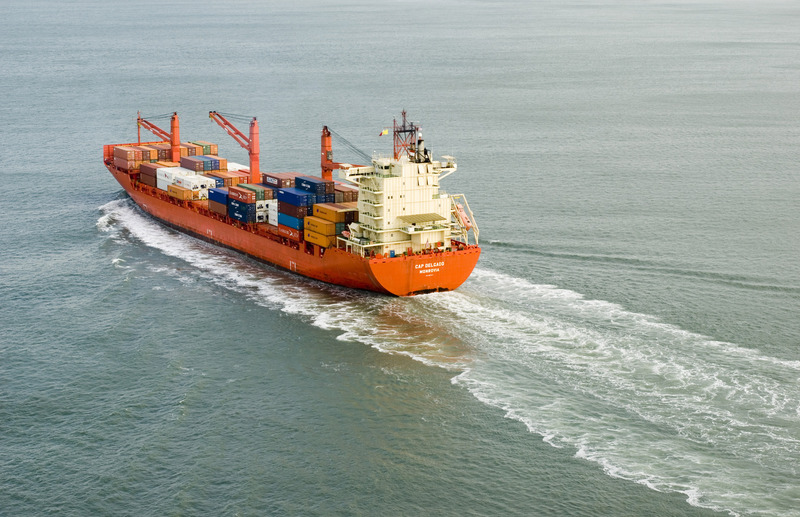 Modeling indicates that just as emissions of CO2 and NOx impact the radiative equilibrium of the atmosphere above global shipping lanes – a positive GHG forcing , marine albedo changes from both ship wakes and phytoplankton blooms locally and regionally reduce solar heat gain. I would guess that ship wakes would count as a forcing, while phytoplankton blooms would be a feedback. Phytoplankton blooms are probably a positive feedback. They increase surface warming by reducing transparency..
Do you see yonder cloud that’s almost in shape of a marine algal bloom? By th’ mass, and ’tis like an albedo change indeed. Nay, Polonius- not by the mass , but by the Mie cross section, for In Wittenburg I was taught the number density rules how deep incarnadine we see such creatures dye the sea. So I guess they all (meaning deep draft shipping vessels) shouldn’t do this? 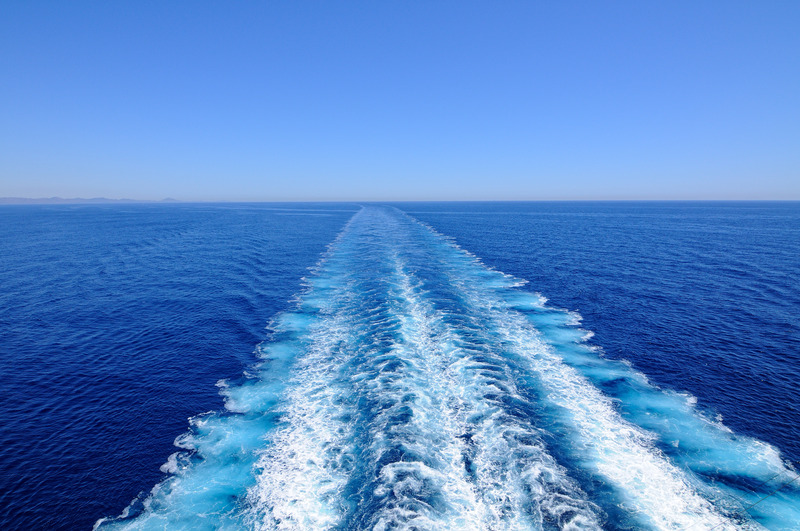 Can increasing albedo of existing ship wakes reduce climate change? Its not like i haven’t been on ~40 deep draft vessels, oh wait, I have. Prop wash/ship wake can only raise the local albedo along the ship path. So, it is simply not possible for ship wakes creating a net positive GHG forcing. Simple as that. A while back there was much discussion of why actual data did not match the CMIP5 average, because there was no reason to expect it to and because there is only one world and other reasons that I thought i understood at the time. Now the data does match the mean and I am confused…. Should I be? The difference is, I think, that the surface temperature show much more variability than the ocean heat content. Hence, the surface temperatures, on decadal timescales, are probably not necessarily a good indicator of the forced response, while the OHC might be better. Of course, if you have had some kind of pattern of surface warming that has influenced the planetary imbalance, then even the OHC might not be expected to match the ensemble mean/median. Once upon a time, people made similar “it’s impossible” remarks concerning jet contrails. The difference is, I think, that the surface temperature show much more variability than the ocean heat content. Hence, the surface temperatures, on decadal timescales, are probably not necessarily a good indicator of the forced response, while the OHC might be better. I’m sort of waiting for peer reviewed skip wake albedo references supporting a darkening/absorption/lower albedo of the ocean surface. I found one above that actually supports my POV. Simple as that. That is all. ATTP, I have a somewhat snarky post with perhaps too many image somewhere in attp limbo. IIRC the climatological effects from contrails and ship tracks (clouds, not wakes) are thought to be relatively small, rather like their relevance to OHC. I see now that you are arguing that the forcing would be negative, not that it is impossible. Also I misread Russell’s post, I parsed it all wrong, he’s saying the same thing as I am. “Marine albedo changes from both ship wakes and phytoplankton blooms locally and regionally reduce solar heat gain. More up to date and supports the NASA study. Glad I don’t fly anymore. This whole thing is still a squirrel started by Russell to divert away from the implications of the OHC data. Russell likes to think that there is massive uncertainty about climate sensitivity being about 3C (ECS), so he won’t like this result at all. I blame Al’s brother, Lee. I wonder which has the larger effect, the increased albedo from the ship wake, or the increase in turbulent mixing of surface water and deeper waters in temperature stratified oceans? More accurate data on OHC is useful, but perhaps not for judging the accuracy of models. That there is a spread of model results may indicate that those that best match the data are just lucky, not necessarily a better instantiation of the climate. That there is a spread of model results may indicate that those that best match the data are just lucky, not necessarily a better instantiation of the climate. I agree; this is an issue. However, I think we expect the OHC to show less variability than the surface temperatures and so it may be a better way to assess models than surface temperatures. Of course, we really want to assess more than one thing, so I certainly don’t think that OHC alone is enough. Having said the above, if the OHC matches some models, then that would either seem to suggest that they’re getting the forcings and feedbacks roughly correct, or that somehow their errors are – by chance – cancelling. Rather larger than the wakes from ships are ‘ship tracks’ the generation of low level cloud ‘contrails’ from the engine exhaust gasses and particles. Yes, that’s why I specifically referred to them as ship tracks (clouds not wakes) above. Vinny, climate change is going to wreak merry havoc with ocean ecosystems as it has done many times before. Trying to drag in ‘climactivism’ and imaginary ‘spurious framing’ is just your denialism showing again. I am not familiar with the details of the models used. But if one type of ocean heat diffusion modelling gave consistently close result to the observed data then that correlation might be suggestive of having got the physics right.. However if most of the models have a much greater spread than the data uncertainty then it is just as likely that the errors are cancelling by chance in the ‘matching the data’ cases. This may suffer from granting climate models a ‘Wisdom of crowds’ skill. But if one type of ocean heat diffusion modelling gave consistently close result to the observed data then that correlation might be suggestive of having got the physics right.. Yes, this seems reasonable. If the ocean diffusion determines the rate at which energy is transported from the mixed layer (which equilibrates with the atmosphere quite quickly) then if one type of diffusion modelling gave consistently close results it would be suggestive, especially if the surface temperatures (which determines the Planck response) were also a good match. Possibly. I was thinking that if the match is pretty good over a multi-decade timescale, then it might be indicative. However, if there isn’t also a match with the surface temperatures it might suggest that the models are still not getting the forcings and feedback quite right. Unless you dispute that warmer and wetter doesn’t imply gooier? Algae blooms are dependent on nutrients, a stable surface layer and hours of sunlight, rather more than temperature. Yes, that is quite good. They do have a full response to that if you down the zip file with the updated paper and the responses to the referees. > Algae blooms are dependent on nutrients, a stable surface layer and hours of sunlight, rather more than temperature. Toxic blue-green algae prefer warmer water. Warmer temperatures prevent water from mixing, allowing algae to grow thicker and faster. Warmer water is easier for small organisms to move through and allows algae to float to the surface faster. Algal blooms absorb sunlight, making water even warmer and promoting more blooms. In other news, blankets don’t really warm. Ya. Dr. Rice I love that aspect of open publishing. Funny how the better arguments about a set of findings are in the peer review comments. Not in all cases ,but in enough cases to make the reviewer s comments required reading.